Today we are going to find out #TenThings about author Val Penny. 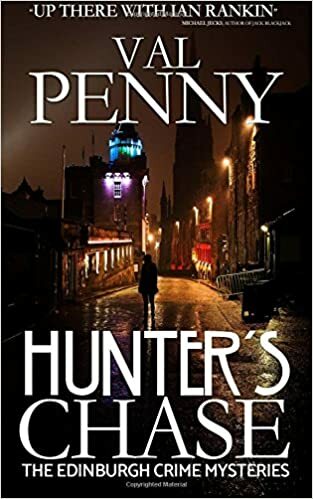 Val’s debut novel, Hunter’s Chase, is set in Edinburgh and was published by Crooked Cat on 2nd February. You can find more details about that below. I have lived in many different places over the years. I was born in California, USA, grew up in Colorado, worked in Virginia then found myself in Scotland when I married a Scot. We now live in SW Scotland which is a beautiful part of the world. The book I am reading at the moment is a biography, ‘Born a Crime’ by Trevor Noah. He is a South African comedian and presenter who grew up during the Apartheid era when inter-racial relationships were illegal. His mother is a black South-African woman: his father a white Swiss man. My favourite animals are cats. I was given my first cat by my great Auntie Lizzy when I was three years old and have kept cats ever since: not pedigree cats, Heinz 57 variety cats. They have all had different characters and different appearances: I just love cats. Imagine my delight when my debut crime thriller novel, ‘Hunter’s Chase’, was accepted for publication by Crooked Cat Books! With my lifelong love of cats it seemed so apt. ‘Hunter’s Chase’ will launch on 02.02.2018. Crooked Cat Books has recently also accepted the sequel in the Edinburgh Mystery Series, ‘Hunter’s Revenge’. It is due for publication in August or September 2018. My present work in progress, ‘Hunter’s Revenge’, is at the stage where I am revising the final draft before my publishers assign an editor to this novel. This is certainly keeping me busy. A question completely unrelated to your book (probably, anyway): how do you name your cats? After books characters? Authors? Celebrities? Or maybe randomly? I had always named my cats after Canadian historical figures. When I married my husband and we got dogs, we named them after guitar players, because that’s his passion.